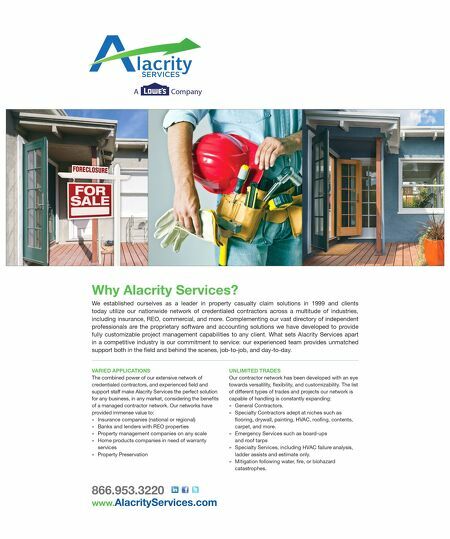 A Company Why Alacrity Services? We established ourselves as a leader in property casualty claim solutions in 1999 and clients today utilize our nationwide network of credentialed contractors across a multitude of industries, including insurance, REO, commercial, and more. 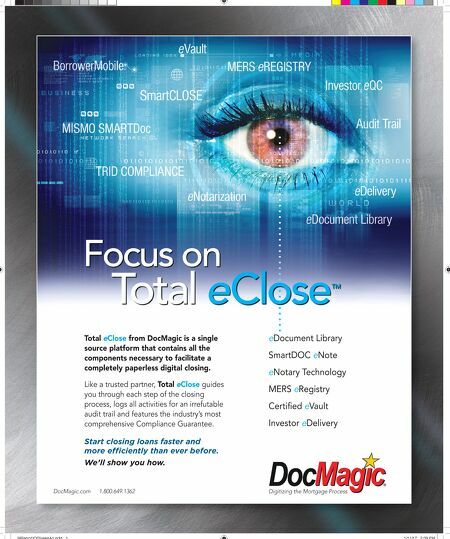 Complementing our vast directory of independent professionals are the proprietary software and accounting solutions we have developed to provide fully customizable project management capabilities to any client. What sets Alacrity Services apart in a competitive industry is our commitment to service: our experienced team provides unmatched support both in the field and behind the scenes, job-to-job, and day-to-day. 866.953.3220 www.AlacrityServices.com VARIED APPLICATIONS The combined power of our extensive network of credentialed contractors, and experienced field and support staff make Alacrity Services the perfect solution for any business, in any market, considering the benefits of a managed contractor network. Our networks have provided immense value to: » Insurance companies (national or regional) » Banks and lenders with REO properties » Property management companies on any scale » Home products companies in need of warranty services » Property Preservation UNLIMITED TRADES Our contractor network has been developed with an eye towards versatility, flexibility, and customizability. The list of different types of trades and projects our network is capable of handling is constantly expanding: » General Contractors. » Specialty Contractors adept at niches such as flooring, drywall, painting, HVAC, roofing, contents, carpet, and more. » Emergency Services such as board-ups and roof tarps » Specialty Services, including HVAC failure analysis, ladder assists and estimate only. » Mitigation following water, fire, or biohazard catastrophes.